Ban the wire cages that hurt little puppy paws! By now, most of us are aware of the cruelty and pain many dogs experience when they are raised by commercial breeders. Perhaps one of the most harmful aspects puppy mill dogs have to endure is the wire cages in which they are kept. Little puppy paws are sensitive, and haven't yet developed the hardened exterior that protects dogs feet from injurious surfaces. Wire cages are not only uncomfortable; they can cause cuts and bruises on paw pads, as well as problems to the dogs' limbs and joints. Wire flooring is also subject to bending and sagging, making the cage even more detrimental to puppies' physical development. If we're not going to outlaw cruel commercial breeding altogether, we can make a difference for the puppies born into that life. Write to the USDA asking that they increase standards for commercial breeding and require solid surface cages for all breeding operations. If you care about animals as much as I do, you will want to give your attention to an important issue concerning puppy mill standards. 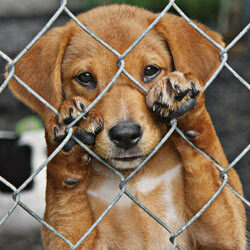 Commercial breeders are the worst offenders when it comes to the welfare of puppies in their care. While animal shelters are required by law to provide solid flooring in animals' cages, the law isn't the same for puppy mills. Wire cages are the standard in commercial breeding. Sadly, though, there is no limit to the damage wire cages can do to dogs' health. They experience joint and limb discomfort and irregular growth from standing on the wires. Their paw pads can be badly bruised or cut from the hard metal. Because wire cages aren't comfortable, dogs remain standing for longer periods of time, resulting in poor posture and stress on muscles. I would like you to require all commercial breeders and puppy mill facilities to utilize only solid bottom cages for dogs. Tell them we see through their profit-minded operations, and hold them accountable for keeping their dogs healthy. If you don't increase America's puppy mill standards, who will? On May 30, 2014, 45,083 signatures were mailed to Secretary of Agriculture Thomas Vilsack in support of the wire cage ban. While we wait for a response, please share this petition with others and spread awareness!